5 candles and a cross!! The beauty that is this book has rendered me speechless. It’s so hard for me to write reviews when I read a book like this. The actual writing is like all of Amy’s books. Perfection. She has a way with words that is insanely splendid. This book is by no means an easy or fast read. I don’t believe it is intended to be. It will show you more evil and history than is probably comfortable for some readers for the simple fact that it is factual. These things really happened. To innocent people. Harmon most definitely did her research and with it, entwined a most beautiful love story. Eva and Angelo have grown up together and always loved each other, but their love was forbidden as she was a Jew and he a Catholic priest. Amy illustrates just how many trials and tribulations love can withstand especially in the face of war and as tortuous as some of these situations are, their love is beautiful. Amy Harmon most definitely also writes historical fiction. She nailed it. I hope she continues to travel across genres because she has proven herself to be talented across every genre she has tried so far. I do not know that all of Amy’s loyal readers will enjoy this book quite as much as her others, but she will acquire more readers with this release and her words will touch even more people than they already do. From Sand and Ash by Amy Harmon is not just a mere book… It’s a masterpiece! Amy proves once again she is in a league of her own… Such extraordinary and infinite talent. 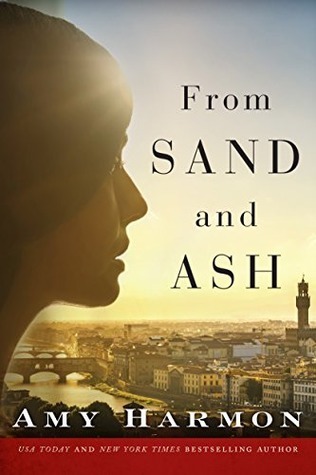 This is an impossible book to review because it’s pure perfection, but I shall try…..
From Sand and Ash touched me immensely. It renewed my faith in God and people. You can tell there was a lot of blood, sweat, and tears involved in this book…. What a labor of love! The amount of work and research put into it is evident. Shown through its vivid depiction of places, endless facts and the vast array of emotions it evokes … You will be transported, mind, body, and soul to Italy during WWII. A place that became exceedingly desperate, devastated and hopeless. Where so many lives were ripped apart and basically exterminated. I literally sobbed and felt sick to my stomach. How could I not? What a horrific time. But through all the sorrow and despair, Amy was able to weave in hope, spirituality and an indescribable love….. Eva and Angelo’s forbidden love story will stay with me forever. A Jewish girl and a Catholic boy who fell in love despite all their obstacles. Two flawed people with perfect souls. Their strength, selflessness and unwavering love for each other and God made my heart ache and my spirit soar. You can not imagine the incomprehensible things they experienced and endured…. From Sand and Ash is probably one of the most expressive and genuine books I have ever read. It’s not something you can read and just forget. It will stay with you forever. I wish I could shout it from your rooftops, READ THIS BOOK. I honestly think everyone NEEDS to!! The definition of a Saint: A person of great holiness, virtue, or benevolence…. That is Angelo and Eva!